Ananth Kumar's body will be kept at National College grounds in Basavanagudi for last respects. 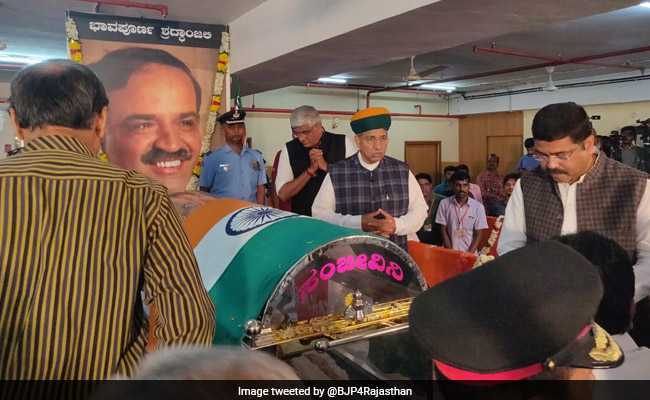 Union Minister and senior BJP leader Ananth Kumar, who died on Monday morning at a hospital in Bengaluru, was cremated with full state honours this afternoon. The funeral pyre was lit by Mr Kumar's younger brother Nanda Kumar, amid chanting of vedic hymns at the Chamarajapete cremation ground. Veteran BJP leader LK Advani, Home Minister Rajnath Singh, BJP chief Amit Shah, and state party chief BS Yeddyurappa paid emotional tributes to the minister. Ananth Kumar was suffering from lung cancer and had returned from the US last month after treatment in New York. He was 59. The minister's wife Tejaswini and two daughters were with him in his last moments. His body was kept at his home in Basavanagudi for the public to pay their last respects. Mr Kumar's body was taken to Jagannath Bhavan, the BJP's state office in Malleshwaram this morning and from there the procession reached the National College grounds for public homage. Despite a busy Monday, Prime Minister Narendra Modi flew into the city from Varanasi in the evening and met Mr Kumar's family. He offered his condolences and laid a wreath on the glass casket draped in the tricolour. PM Modi described him as a remarkable leader, an able administrator and a great asset to the BJP. President Ram Nath Kovind termed his death as "tragic loss". Ananth Kumar was diagnosed with advanced lung cancer in June. He was initially treated at Sri Shankara Cancer Foundation following which he went to London and later taken to a hospital in New York. "The cancer had spread to other parts of his body that resulted in his multi-organ failure and death," the BJP's state unit spokesman S Shantaram said. R Ashok, BJP leader and former state home minister, told NDTV, "I am an lawmaker from his seat. We worked together and he was always so accessible. He will be missed." Congress leader Veerappa Moily said he was an accessible politician. "It was always easy to approach him." UT Khader, Congress leader and a minister in the Karnataka coalition government, told NDTV, "He was a link between the state and the centre and that link is missing now." Ananth Kumar was one of the few ministers to have also served in the earlier BJP-led government of Atal Bihari Vajpayee. In fact, he was the youngest minister in the Atal Bihari Vajpayee's cabinet in 1998 and was minister for Civil Aviation, Tourism, Sports, Urban Development and Poverty Alleviation. Karnataka Chief Minister HD Kumaraswamy said Mr Kumar was a "friend beyond politics" and a value-based politician. "Our families had a friendship beyond politics. He always valued and had given priority to friendship. I have lost a great friend in his death," the chief minister added. Karnataka has announced a three-day state mourning and educational institutions and offices were closed on Monday. He was elected to the Lok Sabha in 1996. In 1998, he became the youngest member of the Vajpayee cabinet and he returned as minister in 1999. In 2003, he became the BJP's Karnataka chief. The party won the highest number of seats in the assembly and the Lok Sabha under his stewardship. The parliamentarian from south Bengaluru constituency held charge of two ministries in the Narendra Modi government -- Chemicals and Fertilisers since May 2014 and Parliamentary Affairs since July 2016.